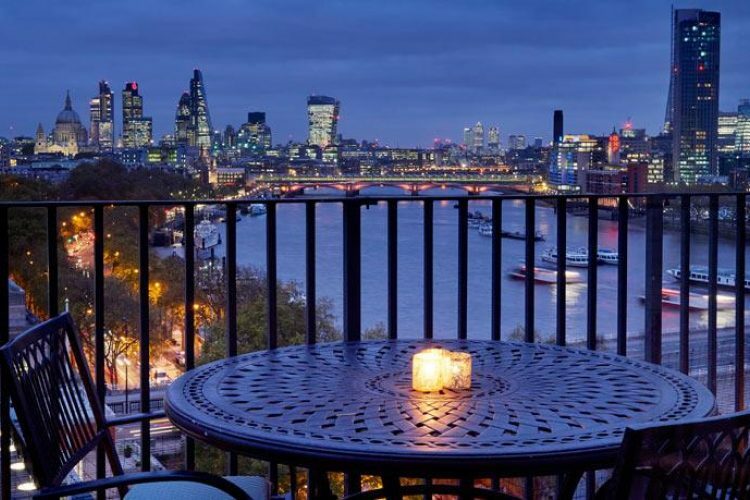 Located on The Strand in the heart of the West End theatre district, The Savoy offers spectacular views of the River Thames. This landmark hotel opened in 1889 and is still considered to be the place to stay in London. The hotels 267 rooms and suites, with Art Deco and Edwardian touches throughout, are elegantly appointed yet offer an extensive array of modern amenities. Located on The Strand in the heart of the West End theatre district, The Savoy offers spectacular views of the River Thames. This landmark hotel opened in 1889 and is still considered to be the place to stay in London. The hotels 268 rooms and suites, with Art Deco and Edwardian touches throughout, are elegantly appointed yet offer an extensive array of modern amenities. One child aged 17 or under stays free in room with parents. If guest is on a package including meals or activities - extra child rates may apply - this information would be in the reservation system. Largest Meeting Room Size: 4629 sq. ft.
With more than 1,200 hotels certified in Canada since its inception in the 1990s, the Green Key Eco-Rating Program awards hotels an environmental rating of one to five Green Keys. Green Key members are then given guidance on how to "unlock" opportunities to reduce operating costs and environmental impacts - and in turn earn more keys. Amazing, the room, breakfast, staff, and gym was great. Even if you don't use the gym I recommend visiting the pool. However, it is pricey but you get what you pay for! I recommend the breakfast package and afternoon tea. I had a glorious birthday tea at the Savoy. Mr Barnes the M.D was kind enough to answer any questions I had when arranging the day. He is a true gentleman, loves the Savoy and really cares about his clients. My father took me to the Savoy as a child. I was awestruck at the glorious architecture, the marble, the glass that shone like jewels, and my dad whispering to me that my favourite actor had just arrived. I danced around the dazzling foyer like a Princess. Yes I was too precocious! Although dad has passed on, coming back to the Savoy was just as I remembered. The tea was glorious, lush delicious cakes, yummy sandwiches, teas and champagne. Byron our waiter, was wonderful. Every member of staff smiled at us and James at the desk was so sweet. Sadly my dad has passed on but he would have loved to see a hotel he adored has not changed, it is the same star of London he knew and loved, a unique, wondrous, memorable establishment. First class and luxurious but very expensive hotel situated in the heart of London. Stayed in this hotel once with a friend of mine. It's afternoon tea in the foyer is a must see. first class service, very welcoming and attentive staff. Although the decore might be a bit outdated in some parts and prices are high, we definitely enjoyed our time. Is it value for money? Probably not at all ! Is it overpriced? Probably YES But at the end of the day you get what you pay for! You definitely can find much cheaper good alternative places but the experience will not match the Savoy. I do recommend this hotel if you don't mind paying the high premium price in return for a premium service that is only matched by very few establishments in London. One can't help but feel that part of the hotel needs updating. The art deco theme has somewhat lost its charm. However the restaurant serves impeccable food and service is world class. Brought my daughter to the Thames Foyer for afternoon tea, couldn’t rate this highly enough! Perfect experience in every way, from the friendly doorman, right through to the elegant surroundings, fabulous pianist, delectable sandwiches, cakes and pastries, perfectly chilled champagne, amazing selection of teas. I could go on! Particular mention to our lovely young lady who attended to our every need at out table, it being my daughters birthday, the special touches they provided were extremely thoughtful. Would return again. Utterly amazing experience. Always a lovely experience to come and eat and sleep here. The staff are professional yet friendly and the location is perfect for those who wish to visit the National Gallery. As a regular guest I recommend this to any tourist coming to the UK. Such a classy place. We were there for the 40th birthday party of a friend in a small private dining room overlooking the outside entrance. The food and service were unbelievably good, impeccable standards from a beautiful place. Highly recommended. I can't say enough about this hotel -- the staff is amazing, the facilities first rate, the location is just perfect. If you are looking to be pampered and dotted on, this is the place. The American Bar is the perfect place for a night cap, high tea is fantastic, and the Savoy Grill is outstanding. Best experience I've had in a long, long time. I highly recommend this hotel! Let make it short: They are good and they know it. The American Bar is a must visit when in London, even if you're from New York, Singapore or other places where you are used to high level bars. The interior won't blow you away, but the staff and the drinks will. Love my stay and will be back. Proud to have the Savoy as a landmark and to bring London visitor here. Wonderful afternoon spent having afternoon tea with a dear friend. The staff could not have been more attentive yet were un intrusive. Our waiter enzo was so obliging, he even did "the rose experience" a second time in order that i could video it. not to forget gene, who will never really appreciate how much her kindness meant to me. i have been before and will certainly visit again indeed, every member of staff we interacted with throughout the hotel was a delight to deal with. 100% customer service and satisfaction, at a cost. American Bar cocktails a MUST do. The Savoy Grill food very very tasty. The room was just stunning. Great two day stay here, will return. This hotel is just excellent. This is a top spot in London. Friendly staff, outstanding premises, great atmosphere, extremely central, best restaurants around, best transport and surrounding. Whatever you can think of in a hotel, you will experience it at the Savoy Hotel. You can't go wrong if you book a room in this beautiful place. Stunningly beautiful. All the history and charm has been preserved through excellent upkeep and renovations. Has everything you need; swimming pool, gym, tea room, restaurant and an amazing 1920s bar. Staff are attentive and friendly. Can't fault this place; went to the Beaufort Bar as part of a gin tour and it finished it off in style. Had a Hidden Shaker cocktail which was superb. The decor is dark and smouldering with gold leaf picking out the details. Great place to people watch - Rod Stewart was there on our night. A lovely place to go and feel special. You need Smart dress . I had champagne lunch. The service and food is 100%. They also do a nice afternoon tea. If you are looking at taking some one out for a treat i would recommend this place. You go for the experience. 1920s design and for out of restaurant. Very good food at justifiable prices if you consider the who experience package. We loved it. You feel 1920s New York scene. The Savoy in London is one of my favourite places to go. The hotel is gorgeous and elegant and the staff are outstanding. You are treated so nicely whether your staying for a weekend or just a couple of hours. Our favourite treat is a hot chocolate and a cupcake best I have ever tasted. We will be back. My boyfriend and I went to the Thames Foyer for afternoon tea. We arrived early and were told our seats would be ready on time. We passed the time wandering around the first floor of the hotel. Once our reservation came up we were seated promptly. The tea was wonderful and service was excellent. The pianist for the night played a good variety of music. I would highly recommend it for anyone willing to splurge a little for date night. The two of us left very full and satisfied! Most amazing experience at The Savoy. The food is outstanding, the staff so warm and friendly and attentive and we were even taken to see the kitchen and meet the chefs which almost made my mum cry with happiness. The place is so iconic and there is so much history behind that it almost feels unreal. The General Manager Thomas and his team delighted us with the best hospitality and dining experience ever! Thank you! I went to the Savoy Theatre to watch Dream Girls, it was a great experience, I'd won tickets to sit in the front row. Staff were very friendly and helpful. Performance & Actors were fantastic. Surprising venue underground. Would definitely re other's to go. Everyone needs to dine here at least once in there lives. I had a beautiful meal with my best friend and we were so pleased with everything after finishing. The food is incredible and the service is so great you might just want to double tip. The setting is fabulous and glamorous and fit for a princess. I highly recommend if you can afford it. Alternatively there's a set menu deal available. Lovely festive afternoon tea at The Savoy. The staff were very attentive and continuously topped up tea, sandwiches, scones and pastries. Piano player was a nice touch, if a little loud. At £85 it is the very top end of what I would be willing to pay however it was a Christmas present for my friend and I. Would I return, probably not. There are so many top end hotels to try and this didn't stand out enough to make me return rather than trying the other 5* hotels in offer. Overall very lovely though. This review is for the Beaufort Bar within the Savoy Hotel. One of the finest cocktail lounges easily accessible in London. Access is by reservation, with priority given to Hotel and Restaurant guests, on busy evenings you may have to wait quite some time to be able to get in, or might not get in at all. The upside to this significant downside is that the Beaufort bar is never overcrowded and always has a calm atmosphere. If you're a fan of Art Deco, then this is one of the finest bars in London to see this. The gorgeous gold and black space feels like it's been transported from 1930's Paris. Prices are high, but the ambiance is perfect, I'd thoroughly recommend a visit for anyone testing the available cocktail standards in London. The cocktail menu is regrettably more fashionable than I'd like, with a focus on complex modern inventions, however the staff are more than capable of creating any classic you might chose to ask for. I assume it's the ambiance, but I've personally found the cocktails in the Beaufort bar to be superior to those from the Bar American, which is in the same building - I'm thinking they're probably identical. The Bar American is also a great place, but in a colonial style rather than Art Deco. Classic cocktail with bags of character. Amazing drinks with stunning theatrics. Staff were friendly and helpful. Everything you would expect. Worth the visit and price if you're a lover of cocktails. Very festive for the Christmas period. Truly a beautiful theatre! The staff is amazingly helpful. I have an injury and they had a special assistant come to make sure I had the easiest time entering. She even came to check on me at intermission! Lovely exterior! Perfect for photos! The Savoy with capital letters. Just a superb place to go. The American Bar here has been voted the best cocktail bar in the world. They will make you any cocktail ever made. The Savoy Terrace is where you can have the best afternoon tea in london. Sandwiches scones and cakes as many as you want all washed down with your choice of one of many tea varieties. They invented good service here. Awesome. More spacious than the Ritz. Though the Ritz had a better desert selection. The teas were lovely the atmosphere is more relaxed. Smart casual dress accepted, you can wear jeans but make it smart and have shoes. About £40 a head for tea. Live music was great and our host was so nice. Highly recommended. Upon arrival we were greeted by very helpful and friendly staff. When we were taken to our room we were told we had been upgraded to a One Bed Suit with River View. When we entered the room I could not believe how amaxing it was. Stunning decor, great views and a private Butler. I have to say we have been looked after very well and hopefully one day we will be able to come back to experience more of what the hotel has to offer. Pleasant hotel. Perfect for meeting friends for a quick bite or a full dinner at the Grill. Courteous staff although sometimes can be too rigid. It is a popular location for theatre goers as it is in the middle of West End. Avoid theatre times as it gets busy. For anyone looking for a quintessential London experience during a holiday in town, this is one of the best places for it. A great choice of bars and restaurants to choose from, just make sure you have a booking. Also recommend you try to see a musical while you’re there. Spent 2 nights here early October and thoroughly enjoyed the experience. All staff attentive when required but also discreet. Quick to action on requests with good follow up also. Only downside was issues with my shirts/jackets which went off for press, hotel misplaced them for a period of 2-3 hours which caused concern. Bellman and concierge in general very good however. One of the nicest experiences in London. Dinner at Kaspar's followed by drinks in the Beaufort Bar. Impeccable service, amazing food and drinks. Alex in the bar has introduced me to my new favourite cocktail, ask for a 'Last Word' and you won't be disappointed. Worth every bite. The ambiance was beautiful including the staff and the food. I couldn't be happier. We did the tasting menu and wine pairing. The meal was the perfect ending to our trip to London. Lovely room with gracious staff. Everyone has treated us with the utmost kindness. The concierge went out of his way to handle a ticket problem for us. We have thoroughly enjoyed our stay. A group of 4 of us visited the Savoy Grill before going to the theatre. The staff were all very attentive and nothing was too much trouble. The food was amazing! Definitely worth the money. Came here for Afternoon Tea. Great service from the word go. Staff was attentive, courteous, and efficient. The tea room is set in a nice location and there is plenty of space between tables. Prices are steep but you get unlimited scones and sandwiches in a great setting with mild piano music. Definitively recommend it for special occasion. We came for drinks to finish off a day out for a friend's birthday. The setting is beautiful and when we visited there was a pianist. The room for afternoon tea and the bar are nicely decorated. All the staff we encountered were polite, helpful and very approachable. A landmark place located on the Strand, the Savoy is an iconic restaurant and hotel. You can expect quality silver service here from the friendly wait staff. The decor is quaint with carpeted walls and booths, giant, hanging crystal chandeliers and ornately decorated furniture. The menu is extensive with plenty to choose from with both meat and fish options. The food itself is delicious and the steak comes highly recommended as it is tender and juicy in all the right places. Amazing place! Very nice and plush interior as one might expect... My wife and I went there for our wedding anniversary dinner and were not disappointed. Must also say thanks to the staff too for organizing a little surprise anniversary dessert message and giving us one of the best tables in the house! Everyone needs to dine here at least once in there lives. I had a beautiful meal with my best friend and we were so pleased with everything after finishing. The food is incredible and the service is so great you might just want to double tip. The setting is fabulous and glamorous and fit for a princess. I highly recommend if you can afford it. Alternatively there's lots of voucher deals online. Stayed overnight in the Savoy, dinner in Kaspars, drinks in the American bar, breakfast, a tour of the iconic suites and the kitchen. Impossible to fault anything. A magical experience made all the better by the fantastic staff who could not have done more for us. Fabulous. Recommend the lobster bisque and the Dover sole (to die for) and whatever Martin the bartender suggests. Too pricey for us to stay at the hotel, but we visited for afternoon tea, which was great. The tea room is gorgeous, with very nice live piano. Tea is expensive, but they'll replenish both food and drink indefinitely, so if you go on an empty stomach you can really get a decent value. I took my wife to the Savoy for a 40th birthday surprise and we both loved the occasion. From the grandiosity of the interior decor to the 5 star service we thoroughly enjoyed it. We had afternoon tea which was, well afternoon tea. I couldn't fault the food but maybe I expected something extra. I've had afternoon tea in many places and this was no different to some of the cheaper hotels. All that said, you pay high prices for the hotel and service. What an amazing experience staying at the Savoy is. We spent one evening to celebrate our wedding anniversary. We were upgraded, I had a private tour of the hotel for my blog. Kaspar's restaurant was amazing as was the American and Beaufort bars. I love the mix between Edwardian and Art Deco and the history behind the hotel. This is my go to London hotel now for sure. I saw Dream girls at the theater, and the show was absolutely incredible. Amber Riley's voice is out of this world and it is mind-boggling that she is able to do that 10 shows a week. I've never seen a standing ovation at the halfway point but I saw it here! lovely service, great attention to detail. My child was treated like a little prince, with a gift and candy upon his arrival. Loved that we had a certain person to go to for questions, and things we needed - like late check outs or suitcase storage, etc. Concierge terrific. The only service issue we had was during afternoon tea our server disappeared for long periods of time - it ended up being a very long afternoon tea (almost two hours) because we kept having to chase him down. Our 4 year old struggled with that. Loved the pool, the room, and the history. My first visit to England in several years and it was wonderful to return to The Savoy. Our room was most comfortable and the Thames view did not disappoint. We enjoyed Tea in the Court, discovered the Beaufort Bar where Natalie mixed us amazing cocktails and walked on the Embankment to visit our favorite statue of Arthur Sullivan. It was very good, but not quite as good as I expected for £1,750 /night. We checked in before our room was ready (which was fine - we didn't expect it to be ready at mid-day) and there was a mix up with someone with the same name. Also everyone seemed to be getting upgrades except us! We came back later to get the key and go to the room, and it took ages for the person to get on to the computer. He took us up to our room and said the butler would be along in a bit, but he wasn't. In general the 'butler service' wasn't quite that; it was a sort of cross between that and room-service. I was surprised to see cigarette burns between the washbasins in our suite. Seen such things before, but at £1,750/night? Also surprised not to have soft-closing toilet seat/lid - you get that almost everywhere now. On the plus side, the view from the suite (614) is stunning, the furnishings are well chosen and elegant, and the butler who served us our dinner was excellent, as was the guy who delivered our breakfast. I first came to the Savoy 50 years ago with my father, and no doubt my wife and I will be back, but maybe not at £1,750/night. I went to meet a family member there after afternoon tea. It was the first time I had been inside but there was a beautiful reception area with seating and artwork on the wall. It feels like walking into the 1920s. I could hear a piano playing and the food menu looked good! I'll be returning soon for a meal when I have a special occasion! The old English china-ware provided in the in-room dining was a special touch and very elegant. The food was delicious and healthy. The hotel itself was top-notch. 10 out of 10. I would definitely stay here again. A beautiful and stunning location on the Strand. A perfect place to celebrate a special occasion and tick off a bucket list item! Easy to get to, not to far from the tube station at charing cross. Set off the strand with a beautiful interior. Eating out here is definitely a premium experience but worth trying for the experience! Would recommend. I visited the Savoy for an evening networking event, and we attended dinner in one of the private rooms. It seemed that night, that each private room, was booked, and the maze of corridors certainly added to the intrigue. As you would expect from a hotel such as the Savoy, the food was great and the service impeccable. I would consider staying here on my next trip to London. Faultless. I often eat and drink in your various bars and restaurants but have never stayed before. I hope it will not be too long before I can repeat the experience. Breakfast was yummy! A wonderful hotel, in a very convenient location for Waterloo and the surrounding area. The staff were very helpful and considerate. The food was good, especially the little chocolate salted caramel dessert. That was to die for! This hotel is absolutely stunning. Stayed for one night as a celebration with my partner. They go out of their way to feel as special as possible. The room was spectacular and spotless and the evening meal was to die for. Great cocktails too! High Tea is a wonderful experience and definitely something worthy of your time in London. The Savoy is meant to be the best High Tea in London, or at least comparable to The Ritz. I'd definitely come back. Only thing i'd have changed is an option for more savoury - it was all very sweet! An elegant classic that has maintained standards and innovative twists. The set menus in the Gordon Ramsey grill room offer exceptional value for the highest quality of food. The "taste of" menu has many Savoy classics in generous tasting portions. I went here for an afternoon tea with my partner. The building is nice the toilets are nice, the food is nice, I felt this place was quite pretentious regarding the staffs persona towards some of its customers. This was in a stick up sense. With a beneath me type of attitude. However the building was nice and the food ok. I don't think I would go here again due to the above. Very nice setting that's not in doubt. However the food on the night for what it cost was not to the standard I expected. The starter I had was the Lobster Bisque which was not that great. After I had the fillet steak and it was obvious that the steak had not been rested long enough as blood was on my plate. That aside the steak and chips were lovely even though it was 50 odd quid. Then I had the pancakes and while the show of making them by our table was nice they were not fresh and I have had better, much much better for half the price. Considering it was 13 quid that's an expensive pancake where u get the smallest scoop of ice cream ever. I was not overly impressed with the food but it was a nice night out and I cannot flat the service. Hence 3 stars. To have lunch at a hotel where the great and the glorious have dined. The building has a fantastic history. Wonderful atmosphere and the food in the Savoy Grill was sublime. Excellent quality hotel. Wonderful Service old school charm..Lovely ambiance.. Lot of the older staff have left which is a shame. Service is still good.Perfect stay while in for London. Took my best friend here for the infamous afternoon tea for her birthday. The staff and service levels were attentive, there's plenty of food and they made my best friend feel really special. This is a fabulously British afternoon tea and would need to be experience by anyone who is a big fan of afternoon tea! Excellent service, good drink selection. A few too many gaudy and gregarious clientele though. The pianist was exceptional but he needs to add Benny and The Jets to his repetoire. Also, there should be a limit of 3 performances of that moon river song every night. The American bar is one of the oldest and best cocktail bars in London if not the world. It doesn't disappoint - innovative, interesting cocktails and excellent service - but it may be busy so be prepared to wait but it is worth it. I drank a black eagle which was a boulevardier riffing with a scotch and soda. Luxury hotel, consistent quality service, attentive staff. Room service breakfast and food quite good. Downside is that hotel guests dont have any priority at the hotel's restaurants and Bars ( all very good), and that there are lots of coming and going and using hotel as a passage way by outside people, not only guests or diners. also I think security needs to be more strong. I have been there this year 3 times and always felt welcome and taken care of. We spent New Years Eve at the Savoy and it was fantastic. The staff were great fun and efficient. The drinks were amazing and the view for the fireworks was pretty good (if a little obscured by trees). Brilliant night had by all. Attended the Pure Beauty awards. Service and surroundings were great. Food was delicious. Must be fashionable to eat food cooked 'ultra rare' nowadays but not to everyone's tastes on the table. Overall a real sense of occasion. I attended a business conference in the Savoy's Lancaster Ballroom. The room is very impressive and staff were incredibly helpful in dealing with queries. Catering and facilities were also excellent but I'm not sure whether that was handled by the Savoy or a third-party catering firm. Top notch venue. Had pre-theatre 3 course meal at the Savoy Grill. Food was excellent, as was the wine. Didn't feel particularly rushed, but we were in and out pretty quickly to get to the theatre after. I went for my sister birthday in Savoy grill restaurant and we had amazing food. I share a Fillet of beef wellington with my sister and we love it. After we had few cocktails in the bar and the atmosphere was amazing. The piano player was fantastic. Lovely place. I have been here for a sunday brunch.. drink as much as you like champagne.. and a good quality buffet.. ive been to too many hotel buffets to like them anymore.. (due to work) but this was good.. nice venue for a special occasion.. Came here for afternoon tea and it was a very lovely experience. The Thames Foyer is a beautiful garden-like setting and the live pianist adds a nice touch to the atmosphere. Very attentive service and the food was very nicely done - amazing presentation and the scone was done particularly perfectly. Do plan ahead as securing a reservation can be a bit of a challenge, even on weekdays.